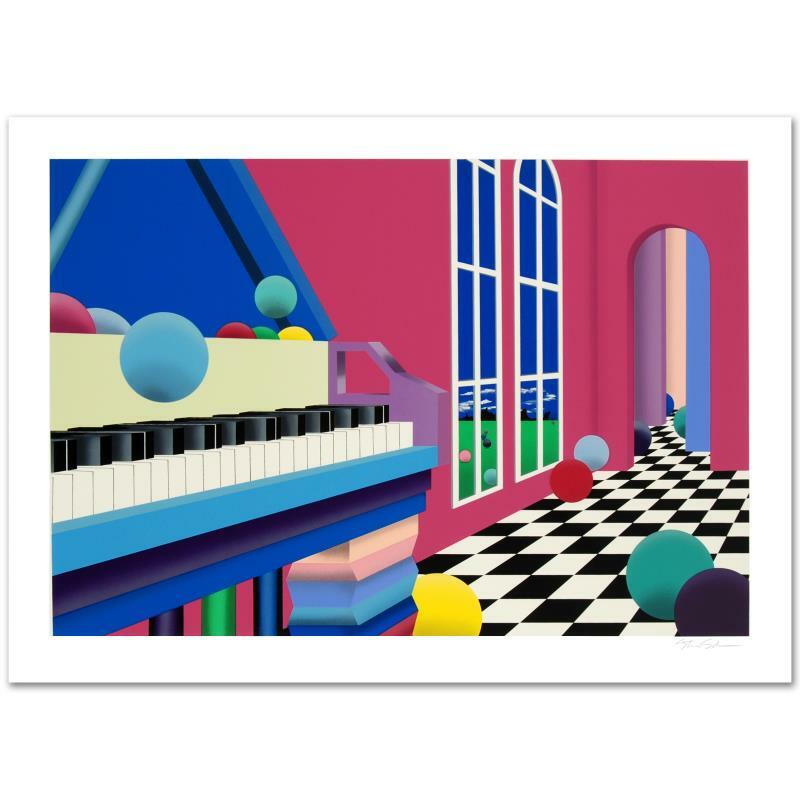 "Grand Ballroom" Limited Edition Serigraph (35" x 23.5") by Neo-Geo Artist Stan Solomon, Numbered and Hand Signed. Includes Certificate of Authenticity. $1,250.00 $125.00 Only 5 Left! With bold, exciting colors and fantastical shapes and images, Stan Solomon's artwork brings intriguing light and life to your walls. 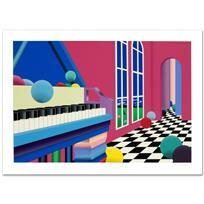 "Grand Ballroom" (1991) is a limited edition serigraph on paper, numbered and hand signed by Solomon. Includes Certificate of Authenticity! Measures approx. 41" x 30.5" (with border), 35" x 23.5" (image). Born in New York City in 1946, Stan Solomon refined his natural artistic talents at the New York Institute of Technology and the Brooks Institute of Photography. After graduating from Brooks in 1976, he taught photography at Every Woman’s Village while working as a freelance photographer. Solomon developed his painting skills autodidactically and has created a unique style of art that is intriguing as well as somehow familiar. Termed "neo-geo" (based on the neo-geometric or neo-minimalist art movements), Solomon’s work is full of abstract or composite images of space-scapes, cityscapes, cars, carousel horses, geometric shapes, and other whimsical images. Using energetic colors and vivid shapes on details and complex backgrounds, his bold paintings draw the viewer in every time. Solomon creates his remarkable artwork in a very organic way. While he occasionally uses photographs for inspiration, the images he paints come from within. Although he sketches on the canvas in the beginning, he rarely, if ever, plans out the sketches, simply using “rulers and pencils and lots of erasers.” Solomon then uses acrylic paints (on a horizontal surface, rather than on an easel). The colors, too, are chosen spontaneously – “I just paint with whatever is there,” he explains. The result, vibrant and exciting, has been well-received around the world. In addition to dozens of shows and exhibitions across the United States, Solomon’s work can be found private and corporate collections, including those of Fox Broadcasting Media, Al Hrabosky, Marriott Hotels, Ice-T, Dave Winfield, and Jody Reed, among many others.